History of Tobar an Léinn Tobar an Léinn is a small 6 teacher primary school located in the village of Raheen, Co. Laois, Ireland. 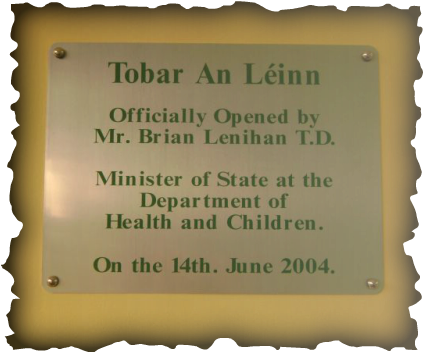 The new school 'Tobar an Léinn' was officially opened on the 14th of June 2004 by the then Minister of State for the Department of Health and Children, Brian Lenihan. Tobar an Léinn had an enrolment of 70 pupils and three teachers on staff when they first moved into the new school in June 2003. The school has since grown and currently has an enrolment of 107 pupils and five teachers on staff. An extension to the new school was added in 2008 to cater for the growing numbers.